The M60 "Patton" medium main battle tank was the U.S. Army's primary armored vehicle during the height of the Cold War. All along the Iron Curtain, Patton tanks stood vigilantly, ready to defend western democracy. The Patton tank on the Army Heritage Trail is a redesigned and upgraded version of the previous M48 medium tank, also called the "Patton." The vehicle was developed to counter the rapidly evolving Soviet T-series tanks, including the state-of-the-art T-54 and T-62. The M60, introduced in 1960, featured a large 105mm main gun, an angular turret for better protection against enemy rounds, and a diesel engine. The A1-A3 models included larger guns, thermal sights, and improved armor systems, resulting in one of the world's most advanced tanks. Today, the M60 series is still in use by many armies around the world. The U.S. Army retired the M60 series in 1997 in favor of the new M1A1 Abrams heavy main battle tank. 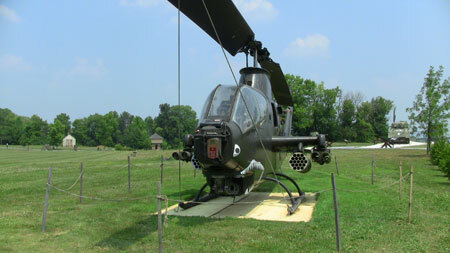 As the Vietnam War progressed, the Army realized the necessity for a helicopter that could carry more firepower than the Huey and function in a strictly combat role. In response, Bell Aircraft Textron developed the AH-1 Cobra, the first true combat helicopter. The Cobra was capable of carrying a 20 or 30 mm cannon, as well as several TOW missiles and rocket pods. Its shape was also adapted to place the pilot behind the copilot, giving the helicopter a much smaller profile and made it harder for enemies to attack. Aside from the combat effectivness of the Cobra, the helicopter's similarities in manufacture to the Huey allowed for interchangeable parts and easy maintenance. To the Viet Cong, the Cobra became known as 'Whispering Death'.